This impression has no doubt been induced by the sight of a preponderance of laymen upstaging the clergy in the sanctuary to have their feet washed. It came originally from Pius XII’s – or rather Bugnini’s – 1955 Instruction, which gave a secular twist to the Mandatum by presenting it as a charter for general benevolence. It has always been understood that the priesthood of Aaron and the Levites in the Old Testament – all of whom underwent ritual foot washing before service at the altar – was a prefiguring of the Mandatum when Christ prepared His Apostles to become priests of the New Covenant by washing their feet. It was because of this understanding that the Church Fathers gave the Mandatum a mystical interpretation, one that required the Apostles to be cleansed from sin and made like unto Christ. 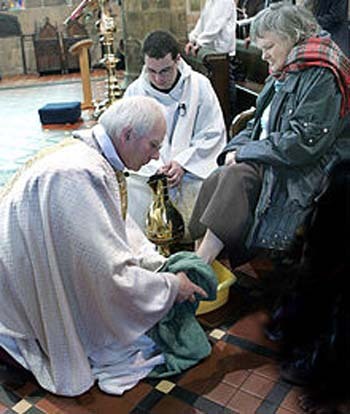 The only explanation, then, that makes liturgical sense is the traditional, hierarchical one: The successors of the Apostles imitate Christ by washing the feet of the clergy who are subject to them: priests, deacons, subdeacons, canons and monks. That was the situation until 1955 when Pius XII’s Commission altered its complexion and meaning by allowing laymen to replace the clergy. It was a calculated decision of the progressivists, motivated by their antipathy to the hierarchical nature of the Church and it was made with full awareness of the likely consequences. “We are still far from drawing the consequences of the rediscovery of the fact that the entire Church is one single People of God and that the faithful compose it along with the clergy. Progressivists thrive on this kind of cryptic ambiguity created by the proponents of the “new theology” in order to accuse the Church of having lost the truth and to blur the essential distinction between the clergy and the laity. We cannot fail to notice that, as a result of this reform, the focus of the Mandatum was suddenly switched to the Protestant “priesthood of the laity,” while that of the ordained minister is constantly being undermined. Indeed, there is clear evidence of this in Vatican II’s promotion of the laity to official positions traditionally occupied by priests in the Church. From being a privileged institution on account of its fundamental role in building the Church – the first Apostles were, after all, its nucleus – the priesthood has passed into a kind of limbo, deliberately marginalized as a function of no great consequence, just one of those myriad “jobs” to be performed by the faithful, to which they are allegedly entitled by reason of their common Baptism. St. Jerome (Epistle to Pope Damasus) stated that the purpose of Christ’s washing of His Disciples’ feet was to prepare them for their duty to preach the Gospel; St. Ambrose (De Sacramentis Book 3, Chapter 1) saw the foot washing as an “aid to sanctification” for the Apostles to resist the assaults of the Devil and concupiscence so as to lead lives of purity befitting their ministry. St. Augustine (Commentary 56 on the Gospel of John 13:6-10) saw it as a means of purification from contact with earthly things so that hearts may be “turned upwards toward the Lord” and “enabled to dwell in His presence.” This same theme of purification of the soul was used by St. Bernard, St. Cyprian and St. Gregory in their interpretation of the foot washing at the Last Supper. The first Christians undertook this task among themselves as a simple act of charity, recommended by St. Paul (1 Tim. 5:10). 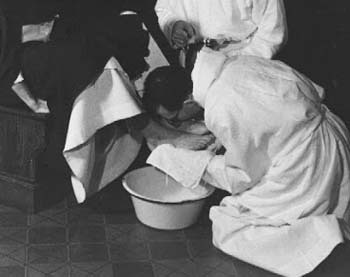 Foot washing was also practiced routinely in medieval monasteries both among the monks and as a gesture of hospitality towards guests. On Holy Thursday the Abbot would wash the feet of 12 monks, but this was not part of the liturgy. Yves Congar O.P., Mon Journal du Concile, Vol. 1, Eric Mahieu, (ed. ), Paris: Cerf, 2000, pp. 135-6. From a November 15, 2015, letter to the Pontifical Council of the Laity marking the 50th anniversary of Vatican II’s Decree on the Apostolate of the Laity.